After arriving from Doha at 1pm, I had nine hours until my 10pm flight to Frankfurt. 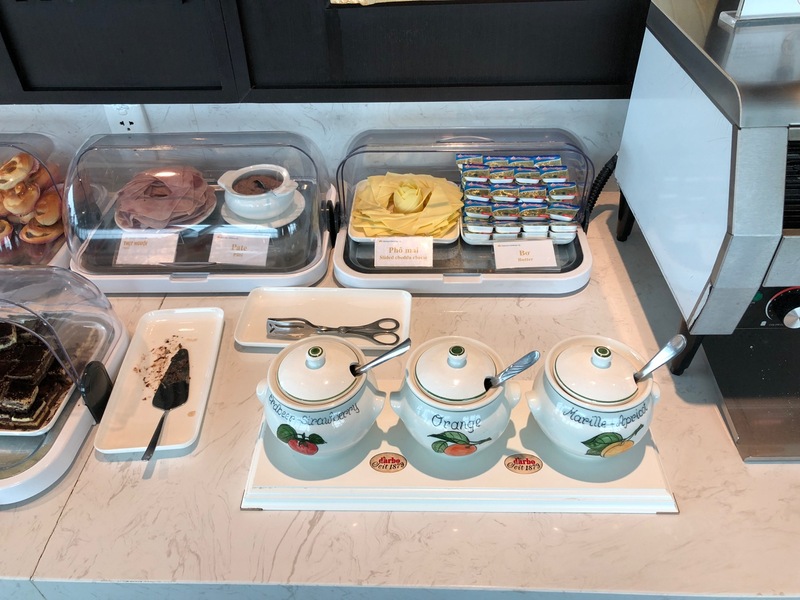 With a full day’s work ahead, I headed straight for the Vietnam Airlines Lotus Lounge, the designated business class lounge for longhaul passengers. I ended up lugging my bag up two flights of stairs only to see there was an escalator in the middle of the main duty free shop. The lounge is located at the end of a long upstairs corridor. Just follow the “Lotus Lounge” signs. The lounge was rather crowded when I arrived, but I found a seat in the corner next to the window. Tarmac views were excellent. Just like the Apricot Lounge, the lounge is managed by Sasco. Not surprisingly, the food was very similar. I’d estimate the lounge seats 200 comfortably. Note the excellent food selection. I was stuffed from my Qatar flight and so busy I ended up eating nothing the entire nine hours. That’s unfortunate, because the Phở looked excellent. Other choices included hot and cold Western and Eastern dishes plus a wide variety of alcoholic and non-alcoholic beverages. Even breakfast were items were available around the clock. Around 6pm the lounge totally emptied out. I was literally the only passenger left. I used the opportunity to take more pictures. There is even a pet relief area in the lounge. Two desktop computers are available. If you’re a smoker, there is no smoking section of the lounge but the airport concourses have smoking rooms. Inside the bathroom, a sign indicates toiletries are available. One shower is also available in each restroom. Internet worked flawlessly during my visit. Look for login codes etched on to every table. Plenty of power and USB ports are located throughout the lounge. There’s no way I’d rank this lounge in any Top 10 Business Class lounge list. Nevertheless, I needed a comfortable place to work with reliable internet and plenty of water to keep my hydrated and coffee to keep me awake (after no sleep on the inbound flight). That’s exactly what I got. This has been renovated over the past few months. It has a fresher look, the bathrooms appear to have been updated, the coffee machine is new ( previously only appalling stewed filter coffee), the food looks marginally better ( although the gruesome croissants are not; amazing in a country with very good baking skills/tradition). This place used to be a major PITA on a long connection but it looks better from the pics/description. What I missed was the lack of the those easy/massage chairs.